Well, that was something you don’t see every day near the Delaware River. 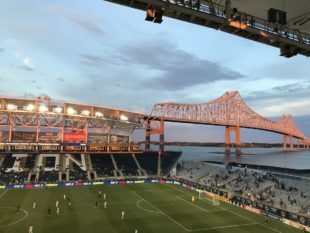 Philadelphia Union steamrolled the Richmond Kickers 5-0 Tuesday evening and advanced to the next round of the U.S. Open Cup. Jack Elliott, David Accam, Anthony Fontana, and Marcus Epps scored first half goals at Talen Energy Stadium, setting a Union Open Cup record. Second half substitute Jay Simpson added a fifth, and an anemic, toothless Kickers club didn’t muster a single shot until the 90th minute. Union head coach Jim Curtin fielded a strong team against the Kickers. Despite starting teenagers Anthony Fontana, Matt Real, and Mark McKenzie, only midfielder Derrick Jones had yet to start for the Union this season. The lineup reflected the emphasis the coach places on this tournament — a tournament in which Curtin twice led the Union to the final. Among Richmond’s starting XI, only center back Mekeil Williams and goalkeeper Trevor Spangenberg had spent time in MLS. Yet head coach Leigh Cowlishaw played for Richmond’s 1995 Open Cup-winning team and has spent the last 18 years managing the club. He’s led them to four quarterfinal appearances in the tournament, including a semifinal finish in 2011. While this was the first ever meeting between the Union and the Kickers, it wasn’t the first time facing Richmond for players like Jones and Real. Both started for Bethlehem Steel in their two wins this season over their USL counterpart. Coming into this first ever meeting between the Union and the Kickers, Richmond had already knocked out two teams from eastern Pennsylvania, eliminating Reading United on penalties before dispatching Penn FC 3-2. Despite their cup success, Richmond has struggled in USL play, where they sit 14th out of 16 teams in the East standings with a 3-6-1 record. The Kickers looked every bit their regular season record, and it didn’t take Philadelphia long to open the scoring. In the third minute, Elliott found space on a Haris Medunjanin corner and kicked home the Union’s first goal of the game. In the 17th minute, Elliott nearly had a second goal from a corner, this time using his head. Spangenberg made a strong dive stop to keep the shot from crossing the line. The Union couldn’t double their lead until the 27th minute, when Accam played Cory Burke through on goal. The Jamaican’s first touch put him past Spangenberg, but the keeper took out Burke. When the referee pointed to the spot, it was Accam who stepped up. The much-maligned winger cooly finished in the top corner and finally broke the ice, scoring his first goal for the Union. Just before the halftime whistle blew, Philadelphia added a third and then a fourth. First, Fontana jumped on a poor turnover in the Richmond box and slotted it into the back of the net. It was his second goal in as many starts for the Union. Next, in stoppage time, winger Marcus Epps scored a beauty, racing down the right flank before cutting back on a dime and curling one into the far corner. After play resumed in the second half, forward Jay Simpson made a rare appearance. Even rarer was the goal he scored in the 49th minute. After Jones danced down the endline and centered a pass, the Englishman knocked it home from close range. It was his first non-friendly goal since Mar. 11, 2017 against Toronto FC. The fans who stuck around got to see the debut of Steel product Michee Ngalina for the Union. The 18-year-old winger from the Democratic Republic of the Congo came on as a second half after signing a short-term deal with the Union earlier in the day. While the Kickers were clearly outmatched, the Union will face a tougher test in the next stage of the tournament. Philadelphia will find out their U.S. Open Cup Round of 16 opponent this Thursday, which will be determined by a geographical draw. The game is scheduled to take place Wednesday, Jun. 20. However, the home team could chose to move the match to the prior weekend. The Union are back in action this Friday at 8 p.m., when they host Toronto FC in MLS play before breaking for the 2018 World Cup. Oh, snap. This was the perfect game to snap streaks. Accam scored his first goal for the Union, and Simpson scored his first goal in a year. The Philly Five. All five Union homegrowns played, and Curtin was hoping they could all be on the field at the same time, but a Fontana cramp popped up before Curtin could make that happen. First impressions. Speaking of Fontana, he’s now scored in both his first MLS start and first U.S. Open Cup start. He still has a long way to go to match Sebastien Le Toux, however. Curtin actually broke the formation at the end and played a 5-2-2-1 when he brought in Trusty for Fontana. I’m hoping that the Union play the next game on the 20th rather than moving it since I’m on vacation from the 12th to the 20th. Unfortunately security decided to step in and kill some of the SOB’s fun. Something was raised up on one of the tifo poles. Security objected to this and confiscated it. My favorite was the “Hey, Haris. F—- Somebody Up” chant when Real got taken out by the two Kickers. Is it too early to start calling him Dirty Harry? Dirty Haris? Who loves Haris? We do. Who loves Haris? We do. Who loves Haris? We do. Oh, Haris, we love you. The “who wears red to a Union game, A**holes, A**holes… who wears red to a Union game, all the a**holes do!” was a quality one as well. Score early and score often. Nicely done, boys, and nice job by Jim Curtain with squad rotation. I saw the last four minutes. I spent the whole match waiting for the US soccer feed to come in. I did not realize the game was being shown on facebook through the Union website until it was too late. Totally bummed. BTW, the was no listing for it in today’s daily roundup, as in where to watch. Yeah there was the Richmond site, but that recommended USsoccer.com and that’s where I sat for most of the match. Just a bummer. Sorry about that. I didn’t think to let the guys know for the roundups. In the past, Ed knew to do that because we’d have the annual “How do we watch the game?” watch going on right up to game time. We’ll keep it in mind with the upcoming matches. In the end it’s truly my fault. I should have started to look around when the feed wasn’t up after the start. But I was assuming the delay was due to weather, not technical difficulties or the match being on facebook. I even tried youtube where the games have been in the past, but they were just links to feeds, and I didn’t want to trust them. Facebook never even crossed my mind as a possibility, and honestly as someone who doesn’t use it, really dislikes the idea. Mostly miffed at myself and US soccer or the Union, or whoever the screw-up belongs to, not really you guys. You do good work. I did the same thing…. Except I never discovered the Facebook stream. Had to settle for highlights. Nice night to be down there. Goals-a-plenty… expected a solid win and was still impressed. Kudos all around! Jones for MOTM. A solid two-way outing. He certainly deserved better than that gash, which easily could have been worse. Accam, by contrast, might have earned the lowest player rating ever for someone who scored. Reading into the tea leaves of who suited up and who subbed in … I guess the Union think they have a chance of overturning Bedoya’s red card. But MLS will miss Medunjanin for a bit. Really? I thought Jones was the only guy (well, maybe Real too) that didn’t look several levels above the competition. Watching this game made me understand why he’s not seeing the field. Curtin thought the same, apparently, since he was critical of Jones in the post-game press conference (per PSP twitter). Welp, I clearly don’t know what I’m talking about wrt DJones. Thanks for the correx, hobosocks. Other than the indisputable quality (read: Medunjanin), who deserves consideration for MOTM? I was inviting debate, not trying to say you didn’t know what you were talking about! That said, I don’t know about MotM specifically, but I was really impressed with Burke. He slowed down after taking that knock late in the first half, but for most of the beginning of the game he just tortured Richmond’s back line. They didn’t or couldn’t work as hard as he did and it showed. He seemed determined to prove he was above USL competition and I thought he did so. I’m very curious about D. Jones. Opinions seems extremely mixed on him last night and I wasn’t able to watch because of the streaming issues. I’m thinking Curtin is trying to motivate him because he’s not playing up to his potential, which the team views as a national team level player. Can we play USL teams in every match? If not, can we at least have the SOB’s sing “Bohemian Rhapsody” every match? A major highlight was the SOB’s rendition of “Bohemian Rhapsody.” Even people in my section were singing along. My player of the match was Epps. He just tortured that fullback all game. Before subbing off in the second half, Epps pulled off a particularly filthy nutmeg in the box. It was against Richmond’s exhausted #10, and the subsequent cross didn’t find anybody home, but still deserves a spot on the highlight reel. Agree on Epps. Completely owned that guy, and then Curtin brings in fresh legs (Ngalina) to torment him further. Why the Philadelphia Union doesn’t. play to win on regular MLS games ?, I am sure they could have won the game against the NY Red bulls.